Vada Pav.. 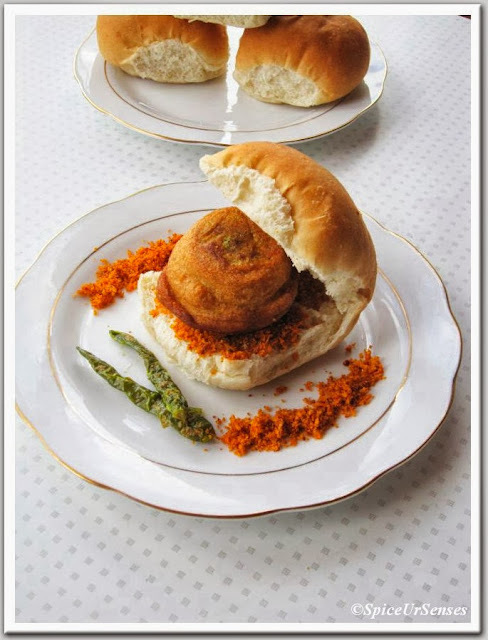 I have eaten this many times in Goli Vada Pav in bangalore, in starting I use to feel good and use to have 2 to 3 times in a week, then the masala what they use started giving me problem and I totally stopped eating Vada Pav. I always wanted to try at home, but use to feel why to do some much of work when you can get it from opposite of the road and stop myself from cooking.. But here there is no option what ever we want to eat I have to cook at home only and I really feel this is a very good opportunity for me to try out many recipes which I have been waiting to try from ages.. 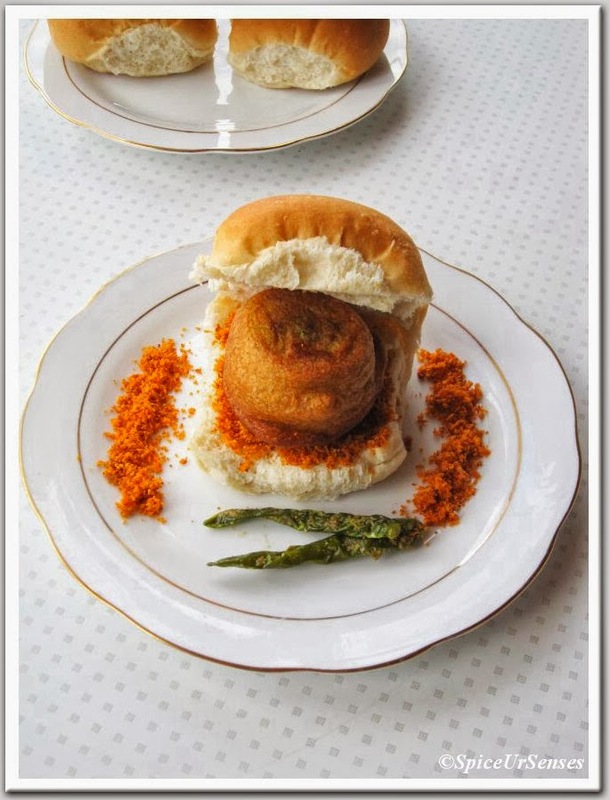 This was my second attempt to cook Vada Pav at home and it turn out to be the tastiest Vada Pav we have ever had and my H loved it and he ate 2 Vada Pav along with 2 green chilli. where he use to always by 1 and eat only half.. When ever he eats happily and more I feel my this much of effort is worth.. 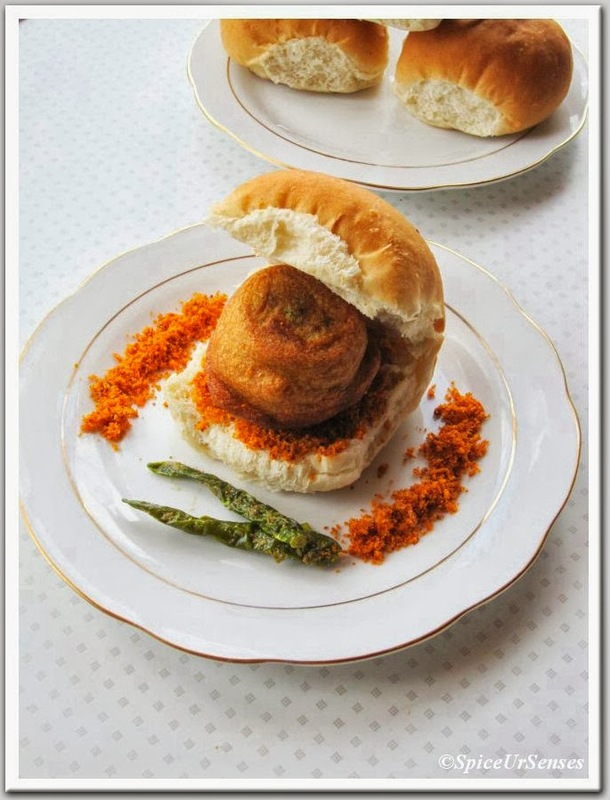 Enjoy the simple and tasty recipe of Vada Pav and make your family members happy..
6 Pav buns (square buns). Ingredient's For Spicy Red Dry Chutney. Step-1. First dry roast all the ingredients of spicy red dry chutney. and grind them into powder (do not add any water) and set it aside. Step-2. Then in a mixing bowl, add all the ingredients of batter for vada and mix them nicely and make a thick batter like we make for bajji.. set it aside. Step-3. Now in a deep frying pan, add 2tbsp oil, mustard seeds, curry leaves, when they start spluttering, add onion and green chilli and fry for 2 to 3 minutes. Then add ginger garlic paste, turmeric, potato and salt, fry for another 3 to 4 minutes. Take out the mixture in a separate plate and allow the mixture to cool. when the potato mixtures is cooled, make 6 to 7 large lemon size balls and keep it aside. In the same frying pan add oil for deep frying the vada's. When the oil is hot, dip one potato ball at a time into the gram flour batter to coat well and then deep fry till golden. Drain on paper towels. 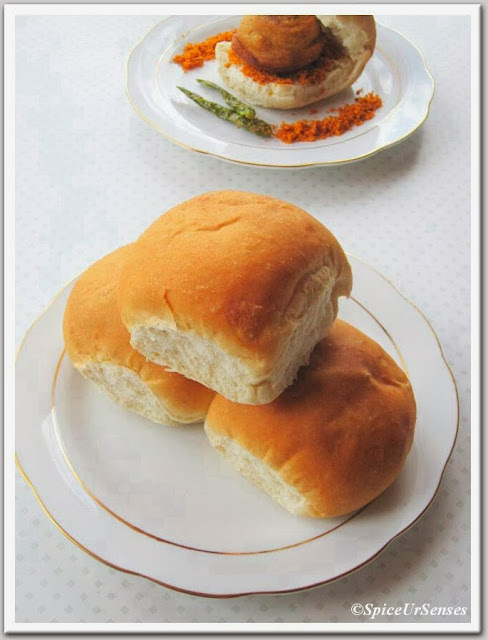 Take one Pav bun, slit in half (not completely - leave one edge joined) and put a spoonful spicy red chutney on it. Place a potato ball on the bun and fold over, pressing down gently. Serve while the Vada is still hot with fried green chilli..
soo very very tempting ..my!! lovely setup..neat. latest post on "pick quicks" blog - a very pleasantly happie-me. looks so delicious and tempting prep. wow.. looks great.. i am on the way to coventry.. pls keep some vada pav for me..
so sos yummm i love it.. 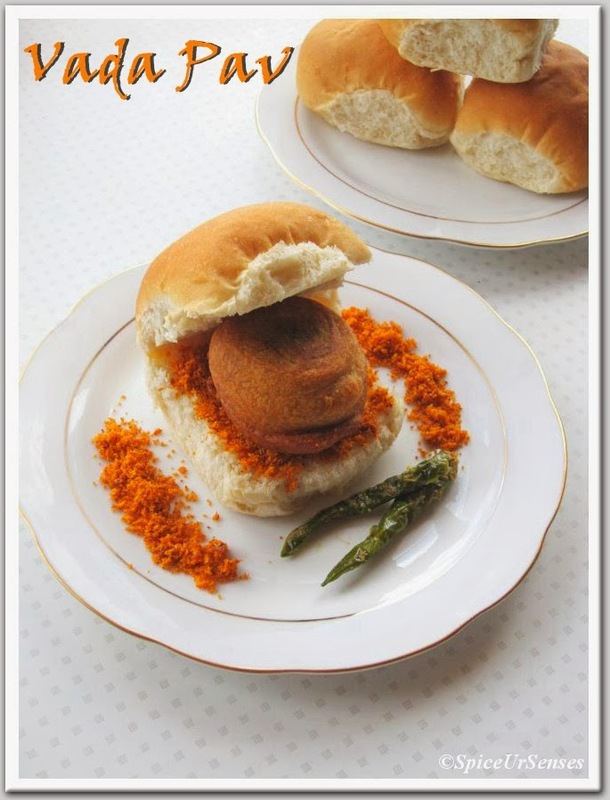 Wonderfully done,who can resist to it.My favourite vada pav. my all time favorite, looks so tempting! MY all time fav chat,but never had good one is recent days.. 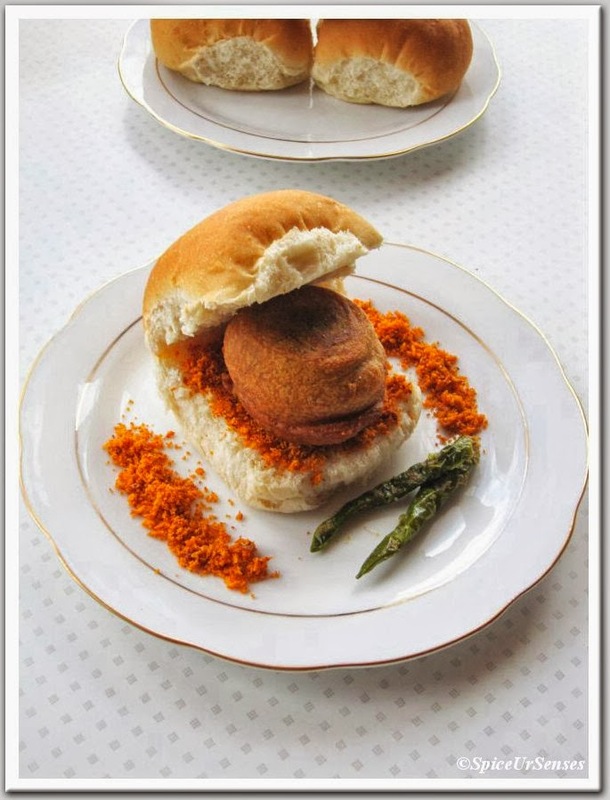 Perfectly made vada pav.. Great snack..
its my favorite...I also used to eat it when I was in Maharashtra...very tempting clicks!!! this is something I constantly crave about. wonderful click dear. 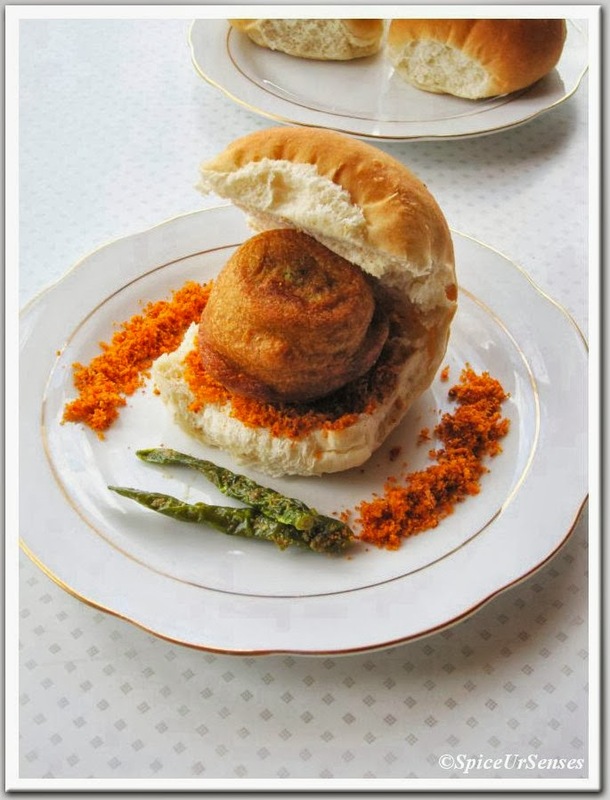 Mouth-watering Vada-Pav! I am never tired of this wonderful snack.